Latest UFO sightings – This UFO video of strange activity in the night sky over Glasgow in Scotland was recorded on 1st January 2010, half hour after midnight. Witness report: While engrossed in a game of GTA IV on my PC I had a gut feeling to look out my window , at first glance it appeared as if someone had released some Chinese lanterns that was until they made a complete stop . I quickly fired up my web cam to try and capture what my eyes were seeing . There was two lights ( UFO’s ) stationery in a straight line while another moved in from the right ( Northwest ) at the same altitude which I would estimate no more than 200 feet and a distance of less than 1 NM . I watched in amazement as the light ( UFO ) from right stopped smack in the centre of the other two lights ( UFO’s ) as the formation of lights ( UFO’s ) tilted downwards in relation to the horizon to an angle were it was clear as day that they were in a Pyramid ( Triangle ) formation . While this was going on another formation of lights were also visible but there pattern was the most peculiar . 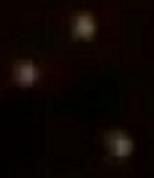 These lights ( UFO’s ) appeared to be in the shape of a HUMANOID although it may not be clear on the video it appears to form a new formation of – and I kid you not a Christmas Tree of all things . Peace and all the best in 2011 .